WINNER WILL BE CHOSEN ON 7/16! The concept behind cafeteria takeover is a team of people traveling to schools to change the food, look, and ambience of the cafeteria. The logo should be bright, sharp, professional and full of energy. This logo is for a non profit organization and will need to be respectfully represented as a global brand. Lunchroom: Please see attached font. 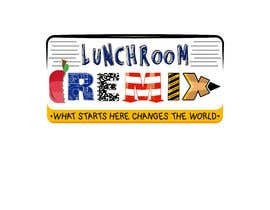 The word lunch room needs to be this exact font or a creative version of it. Please do not depart from the concept. Remix: I am open to design ideas. The most important thing here is that the font chosen should be thick enough to accommodate the font&amp;#039;s fill patterns listed below.I&amp;#039;ve also attached pictures of what I&amp;#039;m looking for here but I am flexible. ***Each letter of the word &amp;quot;remix&amp;quot; should be filled with one of the following patterns. Please see below. you can also find examples of the patterns attached. Tagline: This is another font that I am sticking to. Please see attached and stick to these guidelines. The concept behind that font represent the training paper kids use when they&amp;#039;re practicing writing their name, cursive writing, and capital/lower case letters in grade school. Finally, background. I&amp;#039;m open to a plain white background as it&amp;#039;s clean, however, If it works, I&amp;#039;d be open to seeing a &amp;quot;brown paper bag&amp;quot; colored background for the entire logo and tagline. If you proceed to go this route, I would recommend use a block font. I want school, food, and redesign all over this logo! 7/9 9:35 PM: I like the idea of putting a spiral on whichever letter has the marble notebook pattern. It seems the construction cone is a bit difficult. If you can incorporate some sort of chef knife or food in place of the construction cone, that would give you an upper hand! 7/10 10:03 PM: WINNER BE BE CHOSEN ON 7/16! I have to create log as per your requrements. 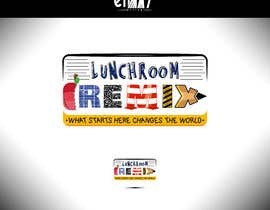 Do you want the "Lunchroom" left alone or do you want it in color? I'd prefer it to be left alone however I do like the one of the blue and brown paper bag options that I've received.